Just a while back I came across an interesting post by fellow blogger Jon. He blogs on Presentation Advisors. In his post Jon talks about how knowing a few PowerPoint skills can take you far. 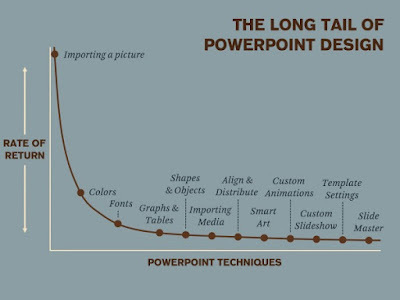 In order to create visually exciting presentations you do not need to know all the PowerPoint tricks and tips. Know which of the are more impactful and will give a better return on investment. Master these first. 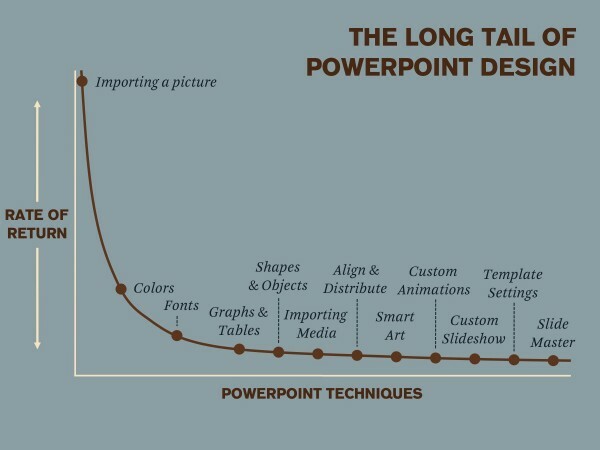 Do not get intimidated by all the thousands of things you don't know about MS PowerPoint. He presents a graph to depict which skills are more important. The one of the left is more important than the one on the right. While I am not sure how he came up with this order, the true lesson from this post is not the order but the realisation that 'few crucial skills' will create more impact. You do not need to master all the tricks now. Let us not worry whether 'Graphs and Tables' is more important than 'Shapes and Objects'. I propose you pick up the top five tricks and master them. Keep watching this space for more on this topic. Get a mac and use Keynote. It's intuitive, easier and looks better much quicker!